Tokyo Gov. 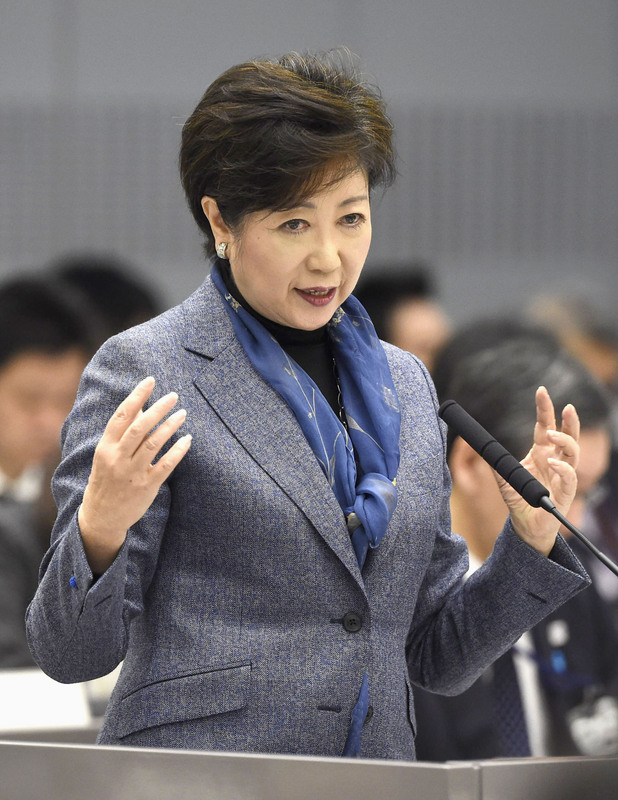 Yuriko Koike came under fire at a committee meeting of the metropolitan assembly on Monday over the metropolitan government’s plan to redevelop the former Tsukiji market site. Assembly members from the Liberal Democratic Party and the Japanese Communist Party argued that a recently published draft of the redevelopment plan, featuring the establishment of an international convention center, is inconsistent with Koike’s earlier proposal to keep some market functions at the Tsukiji site. “We haven’t necessarily changed our policy,” Koike told the assembly meeting, suggesting that the proposal is aimed at utilizing the food culture associated with the Tsukiji brand. The redevelopment plan is set to be adopted later this month and implemented in stages after the 2020 Tokyo Olympics and Paralympics. The plan is likely to attract attention in the next Tokyo gubernatorial election, expected to take place shortly before the 2020 Games. In August 2016, soon after she took office, Koike announced a postponement of the market relocation — then scheduled for November that year — from the Tsukiji area in Chuo Ward to the Toyosu district in neighboring Koto Ward, citing concerns about soil contamination in Toyosu and other reasons. In June 2017, Koike declared that the metropolitan government would carry out the market relocation in October 2018, after taking additional measures against the pollution. At the same time, the governor revealed a basic policy of using the Tsukiji site as a “food theme park” where existing businesses would be allowed to continue to operate. In the following month, the Koike-backed Tomin First no Kai (Tokyoites First) performed strongly in a Tokyo assembly election, while the LDP’s share of assembly seats sank to a record low. The new Toyosu market was opened last October, and the metropolitan government released the draft Tsukiji redevelopment plan in January. But the LDP and others criticized Koike for a “breach of faith” in relation to the plan, as well as an abrupt policy change, during the assembly meeting on Monday. “We’ll develop a new face of Tokyo with innovative and international features, making full use of the capacities of the private sector,” Koike said. “We’ll create a new Tokyo brand,” the governor added, while not mentioning any commitment to maintaining the established Tsukiji brand.